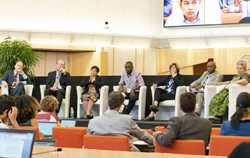 ©FAO/Roberto Cenciarelli19 July 2018, Rome — A global panel exchanged experience and knowledge on the importance of investing in forest education in order to raise understanding and awareness among children and young adults of the sustainable use of forests at a high level World Forest Week session at FAO headquarters in Rome on Wednesday. Education has long been recognized as a key means to influence the knowledge, skills and values of citizens to support sustainable development, a need reflected and raised in multiple international and regional frameworks, and recognized strongly in the Sustainable Development Goals. Yet education dealing with forests is often insufficient and inadequately reflects the many contributions of forests to sustainable development. Today, when more than half the world’s population lives in urban areas, a number expected to rise as high as 70 percent by 2050, the need to rethink the forest education agenda has become all the more urgent. People are increasingly disconnected from nature and lack the awareness and understanding of forests and their essential benefits. According to the panelists, raising awareness among today’s children about sustainable use and conservation will encourage the young adults of tomorrow to make responsible decisions about the environment. It is essential to bring forests into their lives at an early age in order to change common misconceptions regarding forests and their sustainable use. Early education can also inspire young children to learn about the importance of forests and to potentially pursue a career in forestry. Panellists were joined by two university students live from the Philippines by video, Angelica Dao and Luis Chavez, both former students of the Kids-to-Forests education project in the Philippines. Kids-to-Forests, which was launched in 2011 as part of the celebration of the International Year of Forests, aims to develop an awareness and appreciation of forests amongst young children by actually bringing them into the forest to learn. The project has graduated over 500 earth ambassadors, several of whom were inspired to pursue studies in forestry and environmental studies at the university level, including Dao and Chavez.